When Attorney General, Jeff Sessions, used Romans 13 to defend the Trump administration’s policy of separating parents from their children at the border and then went on to talk about how Nehemiah was told by God to “build a wall” to “keep bad people out,” I was reminded at just how much the Bible in the hands of (usually white) people in power, can be wielded in such a terrifying manner, as a weapon in the service of hate, fear, racism, and greed. Jeff Sessions came to the conclusion that there is “no scriptural basis that justifies any idea that we must have open borders in the world today.” These kinds of claims from a supposed Christian leader who teaches Sunday school at his local church is not only sickening, it is deeply harmful. This misuse and weaponizing of the Bible is nothing new of course. It has been an ongoing story in our nation’s history, beginning with white Europeans using the Bible to justify the brutal system of slavery and the killing of Native Americans. People who are queer and transgender have also been victims of Bible-bashing. Most of the queer and transgender folks I know, including myself, carry wounds and in some cases severe trauma because of their “Christian” religious background. So many of us are in need of healing. And I’m not talking about healing from our gender identities or sexual orientations, I’m talking about healing from the trauma of our religious history and the way the Bible has been used as a weapon against us. It is important that as a church, we stand up and bear witness to the truth that we have seen and experienced through the God of Liberation. We must hear the Bible read and interpreted by those who have been on the “underside of history” and on the margins of dominant power. I believe that it is through the eyes of the marginalized that we come to faithful interpretations of the Bible. We must remember and remind each other of the God we serve: a God of Love and Liberation revealed to us through Jesus Christ. And any interpretation of Scripture that is used to crush the poor and beat people down, is not a faithful reading. This summer we will hear from queer and transgender theologians and thinkers about their approach to the Bible and how they have kept faith in God and hope for the future alive amidst the barrage of hate and fear, often biblically justified. I hope you will join us for the summer sermon series and that together we may be challenged to think more deeply about what it means to be the church today, a church that has from its birth at Pentecost, been a church of many cultures, many languages and many kinds of people. I suppose I’d like to challenge Jeff Sessions to read the story of Pentecost in Acts 2. I don’t know any other biblical story more blunt about how God is constantly moving to break down borders and walls that separate us from one another based on nationality, ethnicity, language, and gender. We may be scared to open up our borders (as were the disciples!). But open borders is part of God’s dream and even if we’re challenged by it, we ought to consider what it means for our lives to live into that dream. I’m excited to tell you that there are lots of ways that you can be involved with music at TAB! Consider singing with the TAB Songleaders, a group that rehearses before select Sunday services to add beauty and leadership to music and worship. This group helps the congregation learn new songs and enhance our music. If interested, there is absolutely no obligation to sing every Songleader Sunday—only when it works for you! Reach out to me with your interest and I’ll make sure you are included in the email invitations.If you’re an instrumentalist or vocal soloist, your gifts are very welcome in Sunday morning worship. Do you have interest in playing prelude and offertory? Playing or singing with me on songs or special music? I’m grateful for your gifts and would love to find ways for you to share them with the TAB community. At the June Council meeting, we received reports on the capital campaign, block party planning, and efforts to improve building security during the week through possible changes to the rental agreement and improvements to the alarm system. The major topic of discussion was how we can best choose and support our Mission partners, and the different models for doing so that we have used over the years. #Familiesbelongtogether Day of Action. Families Belong Together. Tomorrow, June 30, we’re rallying around the country to tell Donald Trump and his administration to stop separating kids from their parents! Join us in Philadelphia (Logan Circle, 200 N 19th St.) at 11 am to send a clear message: Families Belong Together! We are coming together to stand up against ALL forms of family separation. We must end family detention, deportations, and the criminalization of immigrant communities. A New Way to Share Announcements on Sundays. If you have an announcement that you want shared verbally with the congregation on Sunday morning, call or email Pastor Katie or the liturgist who is scheduled for that Sunday by Friday afternoon at 5 pm of that week. We will then make that announcement on Sunday morning during the time of Welcome & Announcements. If by the end of the week we have received requests for more than 3-4 announcements, we will prioritize them according to the urgency of the date. We will keep announcements to no more than 4 each Sunday. Remember too that you can always request an announcement to be printed in the bulletin, shared on the website, in our monthly newsletter, and/or on our social media pages (as long as it’s relevant to the mission and life of the church!) Just email Chelle for that request. The process outlined above is only in regard to verbal announcements on Sundays. Bible Study: For July and August the Bible study group will study the scriptures pertinent to the Sermon Series “The Bible is Queer and Genderful”. On July 11 we will study the following scriptures: Isaiah 56:3-8, Matthew 19:1-15 (focusing on verses 11-12) and Acts 8:25-39, and on July 25 we will study Psalm 16:1-8, I John 4:7-12 and Galatians 3:28. We will meet in the Community Room from 5:30 to 7:00 pm. Please join us! Third Quarter Rotation Now Available!The rotation for July-September is now available and can be accessed by visiting bit.ly/TABrotation. There are a few spots (in yellow on the google sheet) where we need a volunteer or two to fill in. If you’re available to fill in on any of those open dates, please let Chelle know! Welcome Can’t Wait: Capital Campaign Surpasses the Mark! The Welcome Can’t Wait Capital Campaign at Tab has been a great success! Over the past few months, pledges have poured in to make it possible for us to install air conditioning in the community room, an accessible unisex bathroom (with shower) on the first level of the building, and upgrade the elevator to make it much easier to use. We couldn’t have done it without all of YOU. The celebration of your generosity on June 17 was also a great success, with everyone enjoying the ice cream social during Coffee Hour! 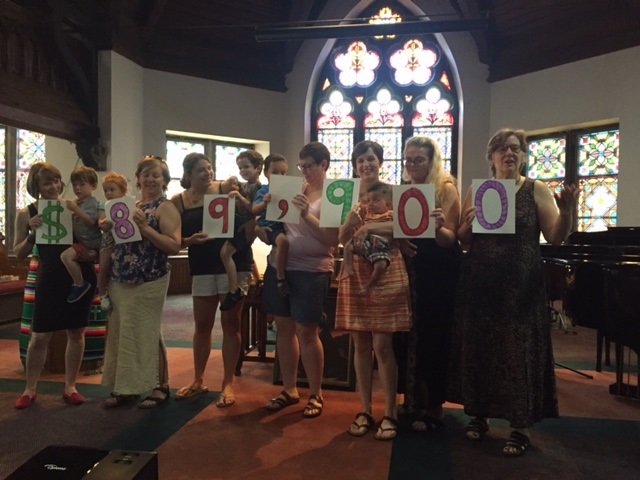 Although our pledges totaled $89,900 that day (see photo), far exceeding our original goal, the total pledged for the campaign now totals $95,550. We also have a verbal promise from one member to bring that total up to an even $100,000. This means that we have a healthy contingency on hand while these three projects are being done in case of any cost overruns or unexpected hiccups (standard issue when doing any work on a very old building like this). So far $43,693 out of the total pledged has been sent to the church for work to begin. We will keep you updated about the progress of the projects. Thank you again for your commitment to making Tab welcoming and accessible to everyone! Upcoming events for POWER: Action Team meeting, July 10, 7-9 pm. July 29 – Sermon Series: Rev. Jean Erb, retired UCC minister and member of Tabernacle United Church. In July and August, we will be exploring how the Bible bears witness to love in a rich variety of expressions. We will work to re-discover and celebrate lesser-known texts that witness to diverse gender expressions and sexual orientations, and we will also wrestle with some of the more difficult passages that have been weaponized as instruments of hate toward LGBTQIA+ people. We will be hearing from queer and transgender theologians and thinkers about their struggle with sacred texts and how they’ve found avenues of liberation and hope through their faith. We will think more deeply together about what it means to be the church today, a church that has from its birth at Pentecost, been a church of many cultures, of many languages and many kinds of people. July 29th: Rev. Jean Erb, retired UCC minister who cares deeply about many justice issues including LGBTQIA and immigrant rights. You’re receiving this email because you’re subscribed to the Tabernacle United listserv or you signed up to receive the Tabernacle United Newsletter.